An Ancient Beast Digimon said to possess explosive, Mach speed power. 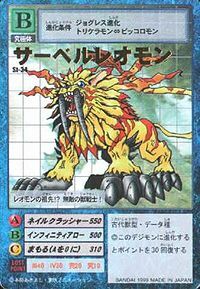 However, the details about it are shrouded in mystery, though a theory suggests that it might have been a Leomon who was transformed into a beast. 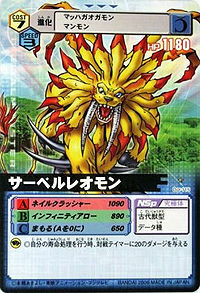 It possesses explosive Mach speed power, and with that speed it can easily dodge attacks, no matter how fast they are. 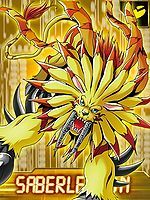 Its two greatly developed fangs and sharp claws possess tremendous destructive power, and it is referred to as the ultimate Digimon. Its Special Move is hardening the countless "Hairs" of its mane and firing them at the opponent (Infinity Arrow). Because its hairs are envenomed, those who suffer this attack have their bodies completely paralyzed. Also, its "Nail Crusher", which utilizes its gigantic claws, is a terrifying technique which tears the opponent to pieces. — Digimon Adventure: "Oh Wind! Oh Light! 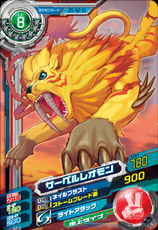 Saber Leomon"
n., Short for Sabertooth 「サーベルトゥース Sāberutūsu」. n., Leo 「レオ Reo」 means lion. 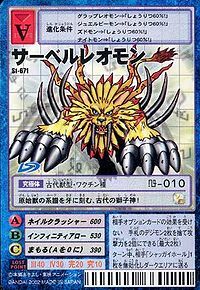 Anime/Manga Digimon Adventure: "Metal Etemon Strikes Back"
Infinity Arrow  インフィニティアロー Infiniti Arō Twin Fang/Infinity Arrow Hardens the hairs on its mane and fires them at the opponent. The hair is venomous, so this attack paralyzes the opponent. 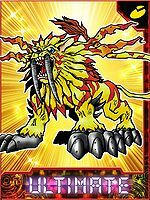 Nail Crusher  ネイルクラッシャー Neiru Kurasshā Howling Crusher Completely destroys the enemy with a smashing blow with its claws. 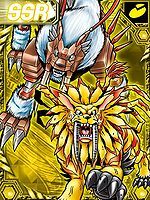 After being exposed to the light of the Digivices, Leomon gained the ability to evolve straight to his Ultimate form, Saber Leomon. He remained an ally, but admitted he couldn't quite control the ability to evolve. He was killed by Metal Etemon when he used up all his strength to jab his claws into Metal Etemon's wound. 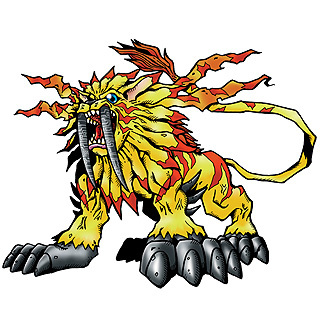 However, Orgemon said that the Village of Beginnings had been ruined by the Dark Masters, so Leomon could not be reconfigured, along with Tyumon, Whamon or Piccolomon. 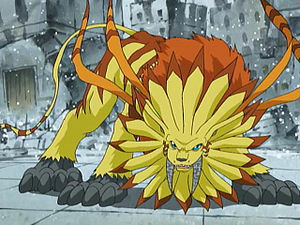 Saber Leomon is mad at the humans because they attacked the Digimon World and killed many Digimon. Unlike Mercurymon Saber Leomon does not want a peaceful solution but seeks only revenge. 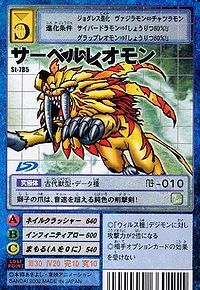 When Saber Leomon arrives in the human world in Episode 22 he destroys several buildings and is able to fight Mach Gaogamon and Rize Greymon with ease. Suddenly Kurata sends a Gizmon: AT into battle. Gizmon weakens the Ancient Beast and disappears. After that Daimon Masaru is able to injure Sabre Leomons right fang with a fist punch. Finally Saber Leomon realizes his imminent defeat and Rize Greymon kills him with his Trident Revolver. 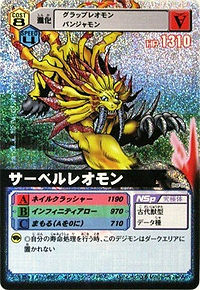 A statue of Saber Leomon is found in Leomon's Ancestral Cave. 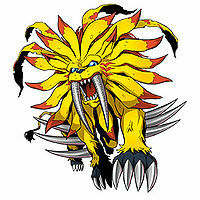 Saberleomon is an obtainable Digimon. 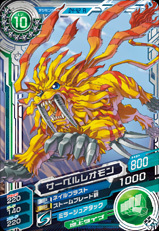 Evolves from Digitamamon (0+ DP), Panjyamon (0-8 DP) or Metal Mamemon (9+ DP). 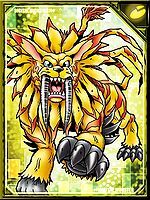 Saber Leomon is the second Ultimate of the Gabumon line. 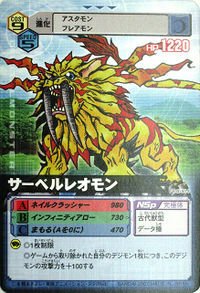 It will evolve from Garurumon in battle if its battle points and happiness requirements are met. 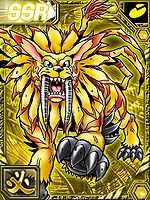 Saber Leomon can evolve from Rapidmon at Lv44 and Attack 200+. 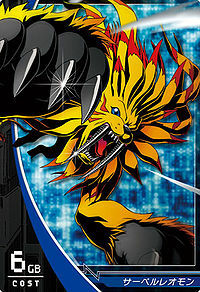 Saber Leomon can be found in Proxy Island in Digimon Story: Moonlight after completing the Gaia Origin quest. 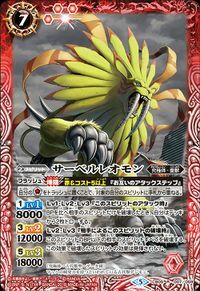 It can also be evolved from Grappuleomon at Lv57, Attack 290+ and Beast EXP 20000+, or formed by the Jogress of Zudomon and Lynxmon. 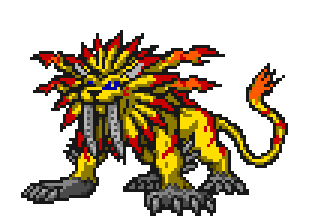 Saber Leomon is found in Proxy Island. 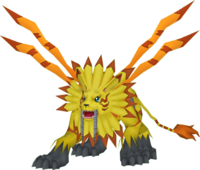 It can also be evolved from Grappuleomon at Lv39, after reviving Saber Leomon, befriended Leomon and Speed 170+. 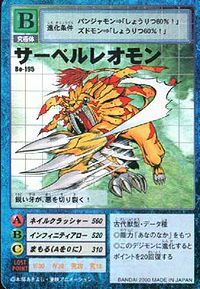 Obtainable by Jogressing Triceramon or Piccolomon with a compatible Digimon. Leomon's ancestor!? An invincible beast warrior! 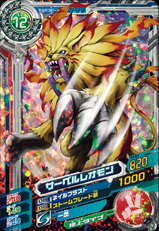 The roots of the primal beasts are carved into this ancient lion god's fangs! This lion's claws are grey daggers that surpass the speed of sound! Its sharp fangs tear evil apart! It possesses a mane which carries a strong poison. Digimon who incur its attack will become completely paralysed and unable to move their body. An Ancient Beast Digimon that has an extremely high instant power output. It uses its claws and giant fangs to rip the opponent into pieces. An Ancient Beast Digimon about whom details are shrouded in mystery. Its special characteristics are its explosive, Mach speed power and venomous hairs. Its two large fangs strike fear into all who see them. Challenging Saber Leomon is considered an act of foolishness, not bravery. 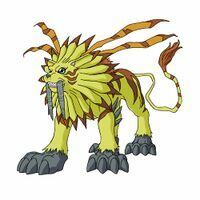 An Ancient Beast Digimon said to be Leomon's ancestor. It is a supreme beast that possesses enough leg power to allow it to run at Mach speed, as well as giant fangs that have great penetrating power and claws that have overwhelming destructive power. An Ancient Beast Digimon said to possess explosive, Mach speed power. ↑ Digimon Adventure: "Oh Wind! Oh Light! 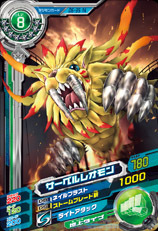 Saber Leomon"
This page was last modified on 21 March 2019, at 17:45.